Marquette and Syracuse meet in the East regional final Saturday in Washington. The Orange are a 4.5 point favorite in a battle of Big East foes. The 26-8 Marquette Golden Eagles tied with Georgetown and Louisville at 14-4 for the Big East title. However, the Golden Eagles were upset by Notre Dame in the quarterfinals of the Big East tournament. They were still given a #3 seed in the NCAA tournament. Marquette came back from a 49-40 deficit with 6:27 to go against #14 seed Davidson Thursday in the second round. Marquette guard Vander Blue made a driving lay-up with 1.5 seconds left to give the Golden Eagles a 59-58 lead, then stole the in-bounds pass to preserve the win. The loss snapped a 17 game winning streak for Davidson. 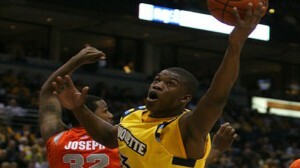 Marquette also trailed late against #6 Butler in the third round. The Golden Eagles came back to beat Butler 74-72 to advance for the Sweet 16 for the third straight year. Marquette ran past #2 Miami 71-61 in the sweet 16 Thursday to advance to the Elite 8 for the first time since 2003. The Golden Eagles will take on #4 Syracuse Saturday in the East Regional Final Saturday in Washington, DC. The two Big East rivals will meet one final time before Syracuse moves to the ACC next year. The winner will advance to the Final Four in Atlanta to play the winner of the South Region. The 29-9 Syracuse Orange looked to be a one seed in the NCAA tournament at the end of February. However, the Orange lost 4 of 5 games to close out the regular season. The Orange ended up tied for 5th in the Big East with Notre Dame with 11-7 records. The Orange did rebound with 3 straight wins in the Big East tournament before losing to Louisville in the Championship game 78-61. In the NCAA tournament the Orange destroyed #13 Montana 81-34 in the second round in the East region. It was the largest blowout by a team seeded #3 or lower in the history of the NCAA tournament. Syracuse beat #12 seed California 66-60 in San Jose in the third round last Saturday. Despite being a 12 seed Cal was rewarded with a virtual home game just 40 miles from their campus. Both teams shot under 40% in an ugly offensive game. Syracuse stymied #1 Indiana 61-50 in the regional semifinals Thursday. The Hoosiers had no answer for the vaunted zone defense of Syracuse. Indiana shot just 33.3% from the field. Syracuse leads the series 8-5 against Marquette. The Golden Eagles won the only meeting between the schools 74-71 February 25 in Milwaukee. The Golden Eagles were undefeated at home this season. Syracuse took an early 25-14 lead in that game, but Marquette rallied to win. The Orange pulled to within 73-71 with under a second left, but Marquette made one of two free throws to go up 74-71. Syracuse was unable to get a shot off. Syracuse is coached by Jim Boeheim. The Orange have losses to Temple in Madison Square Garden, at Villanova, at Pittsburgh, at Connecticut, Georgetown twice, Louisville twice, and Marquette. The Georgetown loss snapped a 38 game home winning streak for Syracuse. The Orange have key wins over San Diego St on an aircraft carrier, Princeton, at Arkansas, Eastern Michigan Long Beach St, and Detroit. In conference Syracuse has home wins over Rutgers, Villanova, Cincinnati, Notre Dame, St. John’s, and Providence, along with road wins at South Florida, Providence, Louisville, and Seton Hall. The Orange are 19-15 ATS and the total is 15-17 this season. Syracuse is outscoring teams 72-59 this season. The Orange are #30 in points allowed. Syracuse is shooting 44.1% from the field and 33.7% from 3 point range. The Orange make 67.5% of their free throws. Syracuse averages 38.7 rebounds per game and allows 30.5 to opponents. Syracuse is #17 in rebounding nationally. Orange opponents are shooting 37.3% from the field and 28.9% from 3 point range. Syracuse is in the top ten nationally in both categories. The Orange average 15 assists, 9 steals, 6 blocks and 13 turnovers a game. C.J. Fair averages 14.5 points, 6.9 rebounds, 1.1 steals and 1 block a game. Brandon Triche averages 13.8 points, 3.4 rebounds, 3.5 assists, and 1.4 steals per game. James Southerland averages 13.7 points, 5.1 rebounds, 1.1 assists, 1.5 steals and 1 block per game. He missed 6 games due to being ineligible. Michael Carter-Williams averages 11.8 points, 4.8 rebounds, 7.6 assists, and 2.7 steals a game. Rakeem Christmas, DaJuan Coleman, Trevor Cooney, Baye Keita and Jerami Grant make up the rest of the rotation. Keita is probable with a head injury. Marquette is coached by Buzz Williams. The Golden Eagles have losses to Butler in the Maui Invitational, at Florida, at Green Bay, at Cincinnati, at Louisville, at Georgetown and Villanova. Marquette has key wins over Mississippi St and USC in Maui, Wisconsin, LSU, UConn, Georgetown, Pitt twice, Seton Hall twice, Providence, South Florida twice, DePaul, Syracuse, Notre Dame, at Rutgers, and at St. John’s. Marquette is undefeated at home this season. The Golden Eagles are 14-15-1 ATS and the total is 17-12 this season. Marquette is outscoring teams 69-63 this season. The Eagles are shooting 46.1% from the field and 30.3% from 3 point range. Marquette is #46 in field goal percentage. Marquette makes 72.9% of their free throws. The Golden Eagles average 35.2 rebounds per game and give up 27.5 per game. Marquette is #33 in rebounds allowed. Marquette opponents are shooting 40.6% from the field and 32.5% from 3 point range. The Eagles average 14 assists, 7 steals, 3 blocks, and 14 turnovers. Guard Vander Blue averages 14.8 points, 3.2 rebounds, 1.8 assists, and 1 steal per game. Forward Davante Gardner averages 11.3 points, and 4.8 rebounds per game. Forward Jamil Wilson averages 9.7 points, 4.8 rebounds, and 1.7 assists. Guard Junior Cadougan averages 8.6 points, 2.9 rebounds, 3.9 assists, and 1.1 turnovers. Trent Lockett averages 7.2 points, 4.9 rebounds, and 1.8 assists per game. Todd Mayo averages 5.6 points per game. Chris Otule, Steve Taylor Jr., Juan Anderson, Jake Thomas and and Derrick Wilson also get significant minutes. Syracuse is 1-4 ATS after a cover and 0-5 in Saturday games. Marquette is 1-3-1 ATS after a straight up win and against teams with winning records, and 1-4-1 overall. The underdog is 5-1 ATS in the last 6 meetings, and the Golden Eagles have covered the last 5 against the Orange. Marquette has faced the Syracuse zone a lot and won’t be as flummoxed by it as Indiana was. This should be in low 70’s like the previous game between them was, and should come down to the wire again. I like Syracuse to pull it out in the end. Our college basketball handicappers are crushing the books in March. let us help you increase your bankroll.